A healthier and simplified version of the breaded and fried classic. I also like that the servings come in uniform parcels of eggplant stuffed with seasoned ricotta and herbs. Leftovers taste great in a sandwich the next day. Cover bottom and sides of large colander with 1 layer of eggplant slices; sprinkle generously with coarse salt. Continue layering eggplant slices, sprinkling each layer with coarse salt, until all the eggplant slices are used. Place the colander over a large bowl and let stand for 30-60 minutes. Rinse eggplant slices to remove excess salt and then dry thoroughly using paper towels. Brush eggplant slices with olive oil and grill on grill pan, griddle, or even nonstick skillet, about 2-3 minutes on each side, until each side is browned and the eggplant is fairly tender. Put eggplant slices to the side to cool while preparing the filling. Whisk eggs and pinch of coarse salt in medium bowl. Add ricotta cheese, 1 cup Parmesan, basil, and black pepper. Lightly oil 15x10x2 baking dish. Spread half of tomato sauce evenly over the bottom of the dish. Divide ricotta mixture filling among eggplant slices, placing about 1 tablespoon filling in the center of each. Starting at 1 short end of each, loosely roll up eggplant slices, enclosing filling. Arrange rolls, seam side down, atop sauce in baking dish. Spoon remaining tomato sauce over. Place mozzarella slices in a single layer over rolls. Sprinkle with remaining 1/4 cup Parmesan. Preheat oven to 350 F. Bake eggplant Parmesan rolls, covered with foil, until heated through, about 30 minutes. Uncover and bake until browned on top and bubbling, about 15 to 20 minutes. Garnish with chopped basil. 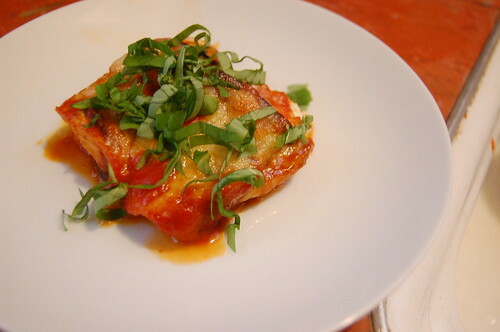 You are currently reading Streamlining eggplant parmesan at Notes on Food.